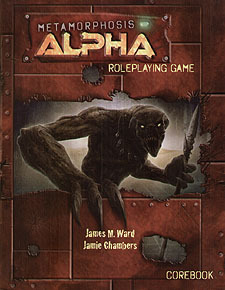 "Metamorphosis Alpha - in any edition - stimulates the imagination, encourages keen thinking, and breaks the mold of typical fantasy and science fiction roleplaying games." A human barbarian cuts through enemies with her sharp blade. A blue-skinned man uses the power of his mind to confuse and evade. A bipedal leopard teleports behind prey before rending with claw and tooth. A shambling tree ventures beyond its grove, peaceful until provoked. They explore strange lands and face many dangers...until they reach the wall at the end of the world. Metamorphosis Alpha contains endless possibilities aboard the starship Warden, built as a gigantic generational colony ship filled with all examples of life on Earth, now a derelict "world" filled with malfunction and mutants who no longer realize they are on a ship at all. This book uses the System 26 game rules for fast-paced action and intuitive conflict resolution. Grab pre-made characters or create anything from pure humans to mutant animals and plants! Enjoy the exploration of classic dungeon crawl, the mutant powers of your favorite comics, and the technology of spacefaring science fiction in an exciting mashup as first revealed in the original science fiction roleplaying game first published in 1976. All you need to play is this book, a group of friends, and six-sided dice.